Asher is an adorable little guy who is 5 years old! He was recently a part of GWCA’s JOY Program in China. 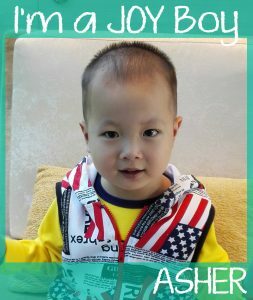 An advocate spent some time with Asher and learned all about him! It is our understanding that Asher has a combination of heart needs. He has not yet received surgery for his special need. Our advocate noted that he cannot over-exert himself at this time but his information should be reviewed by a cardiologist to determine what type of treatment is needed. He is described as being introverted, sweet, polite and he gets along very well with others! He can speak in short sentences but his pronunciation is not very clear. Contact GWCA if you’d like to review Asher’s medical file! 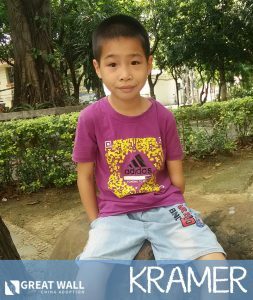 **FINANCIAL GRANT AVAILABLE** Kramer is a cute kiddo who is 9 years old! He has post-operative CHD and limb differences of his left arm. Kramer has a fantastic personality and his caretakers note that he’s quite the popular kiddo among his peers because of how kind and thoughtful he is! He is in the second grade and and makes excellent grades. Kramer has been in a foster family since 2010 and has adjusted very well to living in a family environment! He is described as being helpful, talkative, easy-going and well-behaved. Kramer is very independent and likes to complete tasks on his own. He enjoys playing with other children and being active! Contact GWCA today if you’d like to review Kramer’s file! **MATCHED** Clarissa is a sweet little girl from China that just turned 1 year old. Clarissa has CHD but it appears to be an issue that can be corrected with surgery once Clarissa is adopted. Clarissa is crawling, walking while holding on to the wall, and she is babbling a lot. 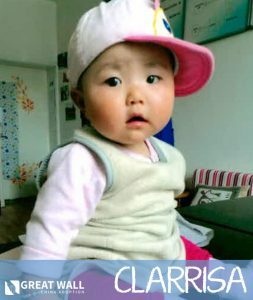 Clarissa is a generally happy baby that enjoys spending time with other children and her caretakers. Clarissa has already been matched with a family, however, if you are interested in learning about kiddos with similar needs, contact GWCA today! Mason is a precious little boy from China that just turned 2 years old. Mason has undescended testicles, but this is often something that corrects itself as the child gets older, or a minor procedure can be done to correct it. His file also says that part of his brain is a little wide in one area, but it doesn’t appear to be an issue in terms of his development at this time. Mason is an active, energetic little boy who can crawl and walk while holding on to something. 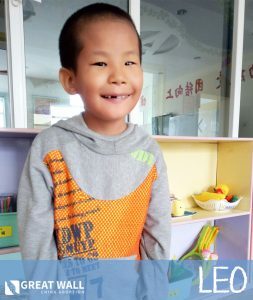 Mason has been living with a foster family since he was 2 months old, so he has been receiving much better one-on-one care than he would have living in the orphanage. He is very attached to his foster parents. He likes to listen to music and clap his hands with the rhythm. He like to play hide-and-seek and play with toy bicycles. He likes bath time so much that he doesn’t want to get out of the bath, so sometimes he gets upset when bath time is over. Mason has good imitating behavior and will copy the words he hears his foster parents saying. He knows the difference between big and small, he can build towers out of blocks, and when asked he can point to his nose, mouth, ears, eyes, etc. 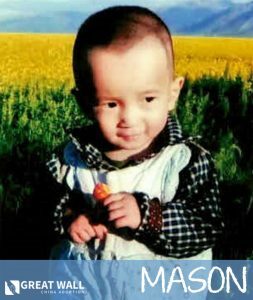 You can contact the China Home Finding Team at Great Wall if you would like to learn more about adopting Mason. We hope we are able to find Mason his Forever Family soon! 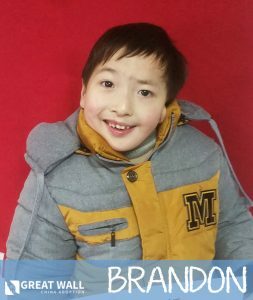 This sweet 8-year old boy’s name is Brandon! Brandon has an extra finger on his right hand and his left ear is slightly deformed, but there doesn’t appear to be any hearing impairment. He also has severe scoliosis, but he is able to walk without assistance! Brandon is a kind, shy kiddo who is hoping to have a forever family soon. He was hosted by a family in the United States and had a amazing time! Brandon transitioned incredibly well with his host family and brought them a lot of joy and happiness. He has a hearty, infectious laugh that his host family loved! They describe him as a sweet, inquisitive, and helpful, saying that he has a very gentle spirit. Please reach out to Great Wall if you’d like to learn more! Meet Peter! 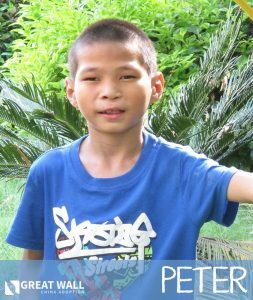 Peter is an 11-year old boy who was born with a cleft lip. Peter had surgery to repair his lip in April of 2008 and has been doing great since then! 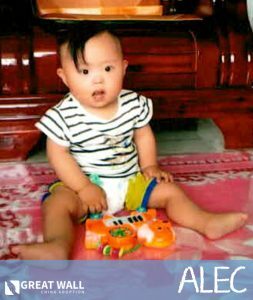 His caregivers say that he is a great learner, and that he has a very active and sunny disposition. His file states that he had some difficulties with language delays, but it is unclear if that was a result of his unrepaired cleft lip. Since his surgery, it sounds like his language development has become stronger. His caregivers love him very much and are eager for him to have a family to call his own. Please reach out to Great Wall if you would like to learn more! Meet Alec! Alec is an adorable 1 1/2 year old boy in need of a forever home! He has Down Syndrome and an atrial septal defect. He is currently living with a foster family and is described by his foster parents as being very affectionate and cuddly. He is not able to stand yet, but he is able to prop himself up and sit without assistance for short periods. He is also not speaking yet, but he is very expressive and is making babbling sounds. He loves to listen to music and will kick his feet along with the rhythm! He’s a sweet kiddo who would thrive with the consistent care of a forever family. Please reach out to Great Wall if you would like to learn more!